Digital cameras produce raw format images that need to be processed and converted to an editable file format before making any adjustments. Adobe Camera RAW is an Adobe Photoshop plug-in that enables you to access raw image formats generated by a wide collection of digital cameras, without having to use third party converters. The plug-in is able to work with raw files created by Canon, Kodak, Konica Minolta, Olympus, Ricoh, Samsung, Leaf, Leica, Panasonic, Sigma, Sony, Casio, Mamiya, Nikon, Pentax, Contax, Phase One, DJI, Epson, Fujifilm, Hasselblad, or Nokia digital cameras. However, keep in mind that only certain camera models are supported, so you should verify on the Adobe website if the files generated by your device can be processed. The Adobe Camera RAW installer will take care of the plug-in assimilation process, so you will be able to access its capabilities without having to leave the Adobe Photoshop application, although in a separate window. Note that you will be able to work directly on the “digital negatives” while keeping the original files intact. 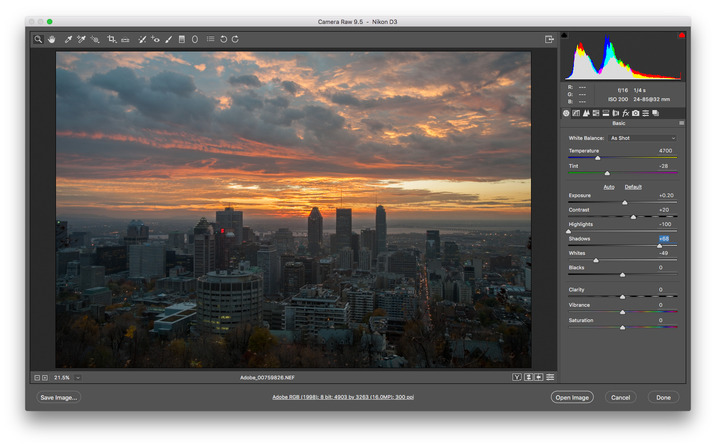 The plug-in window allows you to visualize the image, but also includes basic editing tools, enables you to see the image histogram, to adjust the image exposure, and much more. Before exporting the raw image files, Adobe Camera RAW offers you the opportunity to adjust the image tone, to modify the sharpening effect, to reduce the noise level, to convert the image to grayscale, or to create split toning effects. The same gadgets panel placed on the right side of the Adobe Camera RAW main window includes tools for making lens corrections, for applying various effects (grain, post crop vignetting, and more), or for calibrating the camera. Adobe Camera RAW is a great addition to your Adobe Photoshop photo editing suite: you have all the necessary tools for both visualizing, processing, and converting camera raw data without ever leaving the editor.